Xi Jinping Thought on Socialism with Chinese Characteristics for a New Era (Chinese: 习近平新时代中国特色社会主义思想), simply known as Xi Jinping Thought, is a political theory derived from the Chinese Communist Party General Secretary Xi Jinping. Ensuring Communist Party of China leadership over all forms of work in China. The Communist Party of China should take a people-centric approach for the public interest. The continuation of "comprehensive deepening of reforms". Adopting new science-based ideas for "innovative, coordinated, green, open and shared development". Following "socialism with Chinese characteristics" with "people as the masters of the country". Governing China with Rule of Law. "Practice socialist core values", including Marxism, communism and socialism with Chinese characteristics. "Improving people's livelihood and well-being is the primary goal of development". Coexist well with nature with "energy conservation and environmental protection" policies and "contribute to global ecological safety". The Communist Party of China should have "absolute leadership over" China's People's Liberation Army. Promoting the one country, two systems system for Hong Kong and Macau with a future of "complete national reunification" and to follow the One-China policy and 1992 Consensus for Taiwan. Establish a common destiny between Chinese people and other people around the world with a "peaceful international environment". Improve party discipline in the Communist Party of China. The first official mention of the term was at the 19th National Congress of the Communist Party of China and it has gradually been developed since 2012 after Xi became General Secretary of the Communist Party of China (China's paramount leader). The 19th Congress affirmed the ideology as a guiding political and military ideology of the Communist Party of China (CPC). The affirmation received unanimous support as every delegate voted to approve by raising hands when Xi asked their opinions on the Congress. The incorporation made Xi the third Chinese leader after Mao Zedong and Deng Xiaoping whose names appeared in the list of fundamental doctrines of the CPC, which raised Xi above his two most recent predecessors, former General Secretaries Hu Jintao and Jiang Zemin. In his report, Xi promised to make China strong, propelling the country into a "new era". Xi first made mention of the Thought on Socialism with Chinese Characteristics for a New Era in the opening day speech delivered to the 19th Party Congress in October 2017. In their own reviews of Xi's keynote address at the Congress, his Politburo Standing Committee (top decision-making body) colleagues prepended the name "Xi Jinping" in front of "Thought". Xi himself has described the thought as part of the broad framework created around socialism with Chinese characteristics, a Dengist term that places China in the "primary stage of socialism". 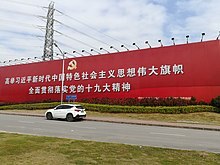 In official party documentation and pronouncements by Xi's colleagues, the thought is said to be a continuation of Marxism–Leninism, Mao Zedong Thought, Deng Xiaoping Theory, "the important thought of the Three Represents" and the scientific development perspective as part of a series of guiding ideologies that embody "Marxism adapted to Chinese conditions" and contemporary considerations. At its closing session on 24 October, the 19th Party Congress approved the incorporation of Xi Jinping Thought into the Constitution of the Communist Party of China. Dozens of Chinese universities have established research institutes for Xi Jinping Thought after the Congress dedicated to advocating the incorporation of Xi Jinping Thought in all aspects of daily life. The concepts behind Xi Jinping Thought are elaborated in Xi's The Governance of China book series, published by the Foreign Languages Press for an international audience. Volume one was published in September 2014, followed by volume two in November 2017. On 27 November, more than 100 of China's top filmmakers, actors and pop stars were gathered for a day in Hangzhou to study the report of the 19th Party Congress featuring Xi Jinping Thought. In July 2018, the carriages of a train in Changchun Metro were decked out in red and dozens of Xi's quotes to celebrate the 97th anniversary of Communist Party of China. The train was described as a "highly condensed spiritual manual" of Xi Jinping Thought by the local government. ^ Phillips, Tom (27 October 2017). "Xi Jinping Thought to be taught in China's universities". The Guardian. Archived from the original on 22 November 2017. Retrieved 23 November 2017. ^ Buckley, Chris (24 October 2017). "China Enshrines 'Xi Jinping Thought,' Elevating Leader to Mao-Like Status". The New York Times. Archived from the original on 22 November 2017. Retrieved 23 November 2017. ^ "19th Party Congress: Xi Jinping outlines new thought on socialism with Chinese traits". Straits Times. Archived from the original on 26 October 2017. Retrieved 28 October 2017. ^ "His own words: The 14 principles of 'Xi Jinping Thought'". BBC Monitoring. Archived from the original on 28 October 2017. Retrieved 28 October 2017. ^ "China's 'Chairman of Everything': Behind Xi Jinping's Many Titles". The New York Times. 25 October 2017. Archived from the original on 26 October 2017. Mr. Xi's most important title is general secretary, the most powerful position in the Communist Party. In China's one-party system, this ranking gives him virtually unchecked authority over the government . ^ a b c Zhang, Ling (18 October 2017). "CPC creates Xi Jinping Thought on Socialism with Chinese Characteristics for a New Era". Xinhua. Archived from the original on 18 October 2017. Retrieved 19 October 2017. ^ "Xi Jinping asks party congress if anyone opposes...Xi Jinping". BBC. Retrieved 28 October 2017. ^ "China Enshrines 'Xi Jinping Thought,' Elevating Leader to Mao-Like Status". New York Times. 24 October 2017. ^ "Xi presents new CPC central leadership, roadmap for next 5 years". Xinhua. 24 October 2017. Archived from the original on 25 October 2017. Retrieved 24 October 2017. ^ Phillips, Tom (24 October 2017). "Xi Jinping becomes most powerful leader since Mao with China's change to constitution". The Guardian. ISSN 0261-3077. Archived from the original on 24 October 2017. Retrieved 24 October 2017. ^ "Chinese universities start 'Xi Thought' institutes". AFP. 30 October 2017. Archived from the original on 7 November 2017. ^ "Second volume of Xi's book on governance published". news.xinhuanet.com. Archived from the original on 6 December 2017. Retrieved 6 December 2017. ^ "China sends its top actors and directors back to socialism school". The Washington Post. 1 December 2017. Archived from the original on 7 December 2017. ^ Gan, Nectar (3 July 2018). "All aboard the propaganda express for Xi Jinping's 'New Era'". South China Morning Post. Archived from the original on 3 July 2018. Retrieved 3 July 2018. This page was last edited on 28 February 2019, at 14:26 (UTC).